The 1948 the United Nations Convention on the Prevention and Punishment of the Crime of Genocide defines genocide as “acts committed with the intent to destroy, in whole or in part, a national ethnical, racial, or religious group.” Abuses of human rights are endemic in genocide, and indeed, genocidal acts can be viewed as the ultimate form of human rights violations. As International Holocaust Remembrance Day approaches on January 27, it is a good time to remember the victims of the Holocaust and to reflect on what we can do to bring about a more humane, just, and compassionate world. Try this lesson, “Strategies for Making a Difference,” from Facing History and Ourselves‘ newly revised edition of Holocaust and Human Behavior, to challenge your students to do just this. Help them think through small steps they can take to bring about positive change in their community. For more information on how you can teach about genocide through a human rights context, please visit our HRE USA’s human rights education library for lesson plans, books, films, take action resources, and more. Black Lives Matter Week in D.C. Attention Educators in the Washington D.C. area! You are invited you to endorse and participate in the D.C. area Black Lives Matter Week of Action in Schools from February 5-10, 2018 to bring social justice issues into the classroom and empower students of color across the D.C. area. D.C. Area Educators for Social Justice, Center for Inspired Teaching, the Washington Teachers’ Union, D.C. area educators, and community members are collaborating on D.C. Area Black Lives Matter Week of Action in Schools. This week of action builds on the momentum of National Black Lives Matter Week of Action in Our Schools campaign taking place in cities across the U.S. to promote a set of local and national demands focused on improving the school experience for students of color. The Unitarian Universalist Service Committee (UUSC) is inviting applications for its Human Rights Innovation Fellowship on the topic “Resisting Criminalization.” Individuals or non-profit organizations with an innovative project that is relevant to the fellowship’s theme can apply. In addition, advocacy organizations, academic institutions, research centers, grassroots organizations, and UUSC partners may apply for the fellowship. The fellowship will provide funding up to $25,000. The fellowship proposal should address a major challenge facing individuals and/or communities who are criminalized in the United States. Criminalization refers to policies and practices that stigmatize, scapegoat, and profile whole communities as “criminal” or “terrorist.” UUSC’s primary goals in this campaign are to advance community protection strategies and expanded sanctuary, decriminalize poverty, and advance restorative justice. HUMAN RIGHTS DAY was yesterday, December 10, the anniversary of the date when the United Nations adopted the Universal Declaration of Human Rights in 1948. Human rights education is as important today as it has ever been in promoting peace, dignity, freedom, equality and respect for all peoples here at home and around the world. This year, in celebration of human rights day, please consider investing in HRE by donating to HRE USA’s newly established Flowers Fund. The Flowers Fund supports innovation and mentorship in human rights education in the United States. Your tax-exempt donation will enable HRE USA to cultivate the next generation of human rights educators by underwriting a variety of creative activities such as internships with member organizations, research, artistic expressions, and collaborative projects among students, teachers, and activists. The Flowers Fund was created in honor of human rights educator, Nancy Flowers to continue her legacy of innovation and mentorship in human rights education. What can we do to contribute to creating a society that promotes human dignity and works to embrace equality, inclusion and respect for diversity? The exhibition “Transforming Lives: The Power of Human Rights Education” raises awareness of the vital role of human rights education in promoting dignity, equality and peace and in preventing human rights violations and abuses. It was created to celebrate the fifth anniversary of the adoption of the United Nations Declaration on Human Rights Education and Training. As well as exploring the concepts of human rights and human rights education, the 25-panel exhibition presents stories of how human rights education has led to transformation and empowerment in the lives of individuals and communities in Australia, Burkina Faso, Peru, Portugal and Turkey. The exhibition also examines what ordinary citizens and civil society organizations can do to nurture a culture of human rights. The exhibition was co-organized by the SGI together with HRE 2020, the NGO Working Group on Human Rights Education and Learning and the Platform for Human Rights Education and Training, with thanks to the Office of the United Nations High Commissioner for Human Rights. The exhibition is currently available in English and French. HRE USA is excited to announce the creation of the Flowers Fund. Established in honor of Nancy Flowers, the fund will be used continue her legacy of innovation and mentorship in human rights education. Please consider contributing today to help us advocate for and further develop programming that supports human rights education and our ultimate goal of making human rights a reality in each community. 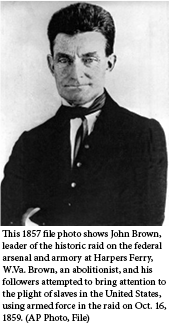 On 5 May of this year, the Vermont legislature adopted a concurrent resolution “designating October 16, 2017 as John Brown Day in Vermont.” To commemorate the day, the Woodstock Social Justice Initiative is hosting a Brown celebration and anti-racism event in Woodstock, Vermont on the October 14th aimed at empowering community members with the understanding and tools needed to take action against racism. Several renowned experts on Brown, abolitionism and anti-abolitionism in Vermont and New Hampshire will be presenting, as will local educators who will demonstrate how they teach about Brown and other controversial figures. Continuing education credits will be available.